Have you had one of those weeks where the weather is poor and everyone is stuck inside? You start using the TV and other electronic devices more as the week goes on because you are running out of sane ideas. Or maybe someone got a new device for Christmas and you haven’t made eye contact since? It happens to the best of us. Turn off the TV, mute the phones, put the devices in a basket and leave it in another room. Unplug and start making those real connections. It has been raining a lot here in Colorado lately. My family definitely spent too much time inside and in front of screens. 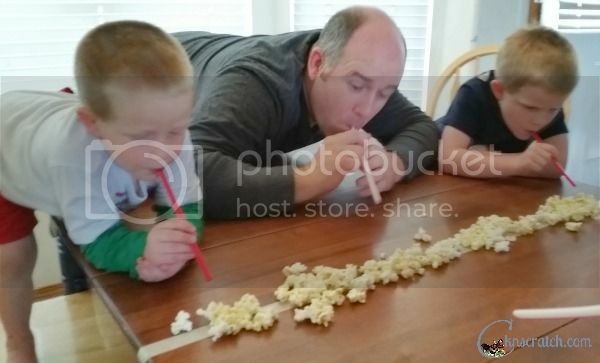 We needed to unplug so we took the challenge and unplugged, popped, and connected with our own Popcorn Games. First divide into teams and pick a name- we assigned each team to a popcorn flavor. Team Blast O Butter for the Boys and Team Healthy Pop for the Girls. The winners get to use their popcorn flavor after the games and go first in assembling their after game snack. Tape a line across a table marking where the catapults can't cross (masking tape works great). Continue taping off lines at various distances along the table and give them different point values. Then tape one line that divides the other lines in half- one side for each team. 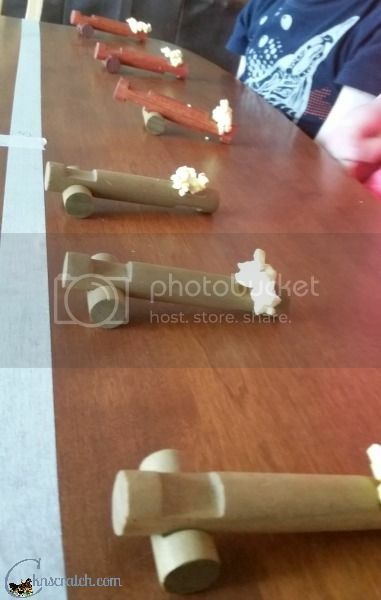 Gather enough catapults for each team member and set them along the end of the table (we used Lincoln Logs). Finally, place one big bowl of popcorn between the two teams as ammo. The goal is to collect as many points as possible within a timed period. The trick is, not all your catapulted popcorn will make it in your team’s area so working on aim as well as speed is important. 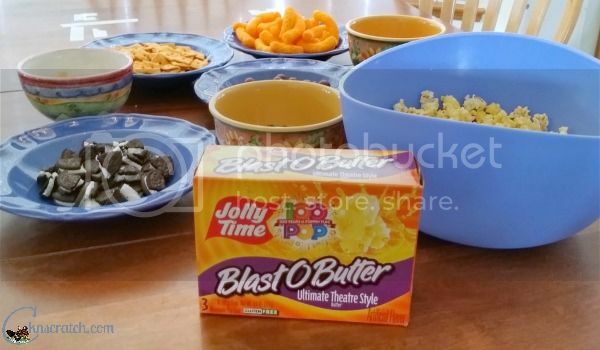 Pick 2 different flavors of popcorn that are easy to tell apart like JOLLY TIME's Healthy Pop and The Cheez- count points based on flavor, not sides of the table. Tape a line in the middle of a table. Assemble teams on opposite sides of the table. Give each team member a straw. Pile JOLLY TIME Pop Corn along the taped line. When given the signal, both teams use their straws only (no hands!) to blow the popcorn onto the opposing team's side. If it falls off the table on the opposing side, you get a point. The team with the most popcorn on their side of the floor loses the game. Counting the pieces of popcorn at the end also helps with cleanup. Place some popcorn in the middle of one end of the table. Tape off the right and left sides of the pile then place a bowl behind each line of tape- you are marking a space for the popcorn and a line that the bowls can't cross. 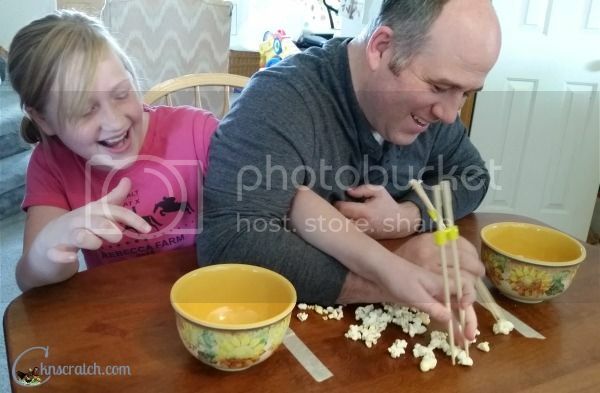 Grab 2 pairs of chopsticks (if you have little ones, chopstick helpers are great). Place one chair directly in front of the popcorn pile. One member from each team shares the chair. They must link arms at the elbows and use the chopsticks in the hand that is linked. 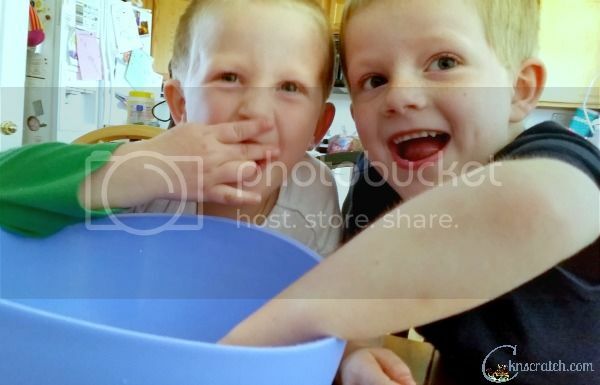 The goal is to put as many pieces of popcorn in their team bowl as possible in 1 minute. Arms must remain linked the entire time. At the end of the minute, count the amount of popcorn in the bowl for each team and declare a winner for that round. The team that wins the most rounds, wins this game. Best 2 out of 3 wins. You can imagine the fun and laughter that occurs with these wacky takes on classic games. And as an added bonus, snacking on the game pieces is totally allowed and sometimes makes the game more challenging. The winners of the Popcorn Games get to be first in creating their after game snack! Creating a build-your-own snack ensures that everyone gets exactly what they want. Gather some of your favorite popcorn and mix-ins. My personal favorite mix-in is chocolate covered raisins. Set it all up buffet style then start with a generous JOLLY TIME Pop Corn base. Add your mix-ins and enjoy. If you really want to mix everything together well, pile everything in a paper bag, fold it shut, and shake! Discover more great recipes from JOLLY TIME Pop Corn on Facebook. Not only did we have lots of laughs and happy tummies when it was all over, we made some great memories as a family. The frustrations melted away and we talked about the fun while we ate our delicious snack. In fact, the kids loved the undivided attention and games so much, they begged for us to do it again the next day. So we did. Your turn- How do you get your family to unplug and connect? Do you have a favorite family game?